NEW DELHI—A Tibetan exile lit himself on fire and ran shouting through a demonstration in the Indian capital on Monday just before a visit by China's president and following dozens of self-immolations performed in China in protest of its rule over Tibet. Indian police swept through the New Delhi protest a few hours later, detaining scores of Tibetans. The man apparently had doused himself with something highly flammable and was engulfed in flames when he ran past the podium where speakers were criticizing China and President Hu Jintao's visit. About 30 such protests have occurred over the past year in ethnic Tibetan areas of China, and a Tibetan self-immolated last year in India, where many exiles reside. 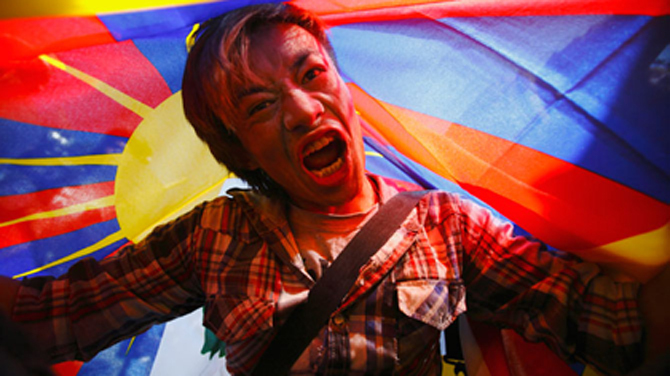 Beijing has blamed the Dalai Lama for inciting them and called the protesters' actions a form of terrorism. Tibetans inside China and exiles say Beijing's crackdown on Tibetan regions is so oppressive, those who choose such a horrific form of protest feel they have no other way to express their beliefs. Activists said the exile who self-immolated on Monday is Jamphel Yeshi who escaped from Tibet in 2006 and has been living in New Delhi for two years. The 27-year-old was burned on 98 percent of his body and his condition is critical, according to the Association of Tibetan Journalists. While activists had been whispering on Monday morning that something dramatic was expected at the protest, organizers insisted they were not behind the self-immolation. “We have no idea how this happened, but we appreciate the courage,” said Tenzing Norsang, an official with the Tibetan Youth Congress. Hu is expected to arrive in India on Wednesday for a five-nation economic summit. Norsang called on the summit participants to discuss Tibet. At the protest site, a large poster of Hu—with a bloody palm print over his face—said, “Hu Jin Tao is unwelcome” at the summit. “This is what China faces unless they give freedom to Tibet,” said Tenzin Dorjee, a young onlooker. Many of the protesters who have self-immolated in China are Buddhist monks or nuns, often in their teens or early 20s. They have done so while calling for the return to Tibet of the Dalai Lama and to protest Chinese rule over their homeland. Security forces have taken many away, and it is unknown how many survived. The origin of this form of protest is unclear. Some activists see inspiration from the Arab Spring protests, set off by a Tunisian fruit seller's self-immolation. Others see historical examples among Buddhist monks—those who protested Vietnam's crackdowns in the 1960s and Chinese in the last imperial dynasty. The economic summit Hu will be attending this week involves the leaders of Brazil, Russia, India, China and South Africa, who form a grouping known as BRICS. Police in New Delhi were already bracing for protests by the tens of thousands of Tibetan exiles who live in India. Security around the summit location has been tightened, and roads leading to the hotel will be closed to the public a day ahead of the meeting. Rajan Bhagat, a spokesman for the Delhi police, did not know how long the protesting Tibetans would be held, or how many had been taken into custody. Tibetan protesters normally are held for anywhere from a few hours to one day—often to stop them from further embarrassing Indian authorities during Chinese visits—though detainees legally can be held for up to one week.